The first of three conjunctions of Saturn and Uranus took place during this Moon at the zodiacal position of Galactic Center, what the Maya call Hunab Ku: One Giver of Movement and Measure. The following article was written near the opposition of these two planets in 2008 and is updated regularly. (Most recent update: September 27. 2012) It is directed specifically to those individuals who are, in their own way, seeking to manifest the Dream of Harmonic Convergence. The 45 year cycle linking the planets Saturn and Uranus presents a potent astrological context for understanding the progressive manifestation of the Dream of Harmonic Convergence and for divining appropriate future action devoted to its fulfillment. Further, by expanding that context to also include the mythological symbolism of The Lightning Path, we can intuit from its astro-mythological divinations, potent guidelines for fulfilling what, in essence, the Saturn/Uranus cycle represents. And just what does this planetary pair stand for? Firstly, Saturn represents the principle of limitation and form building. It signifies all that is tangible and touchable. It is the concrete world. Many astrologers relate it on a personal level to the psychological function of the ego and its limiting nature. Saturn, as ego, creates paradigms, those sets of limiting beliefs that each of us lives by. Uranus, on the other hand, represents all that is not of the ego; all that is transcendent to it; all that unexpectedly busts the ego’s paradigms thus causing it to grow beyond its previous limits. Prior to the invention of the telescope, Saturn represented the furthest reaches of the solar system visible to the naked eye. It was the telescope that first brought Uranus into collective view. Understandably, Uranus has since become associated with all manner of inventiveness and of creative genius. It represents all that challenges the Status Quo to change. The cyclic relationship between Saturn and Uranus is approximately 45 years in duration. During that time it goes through a predictable series of changes in structure. These can be understood by relating the Saturn/Uranus cycle to the basic archetype of ALL cycles of relationship: the lunation cycle -- the complete series of Moon phases between one New Moon and the next. Why? 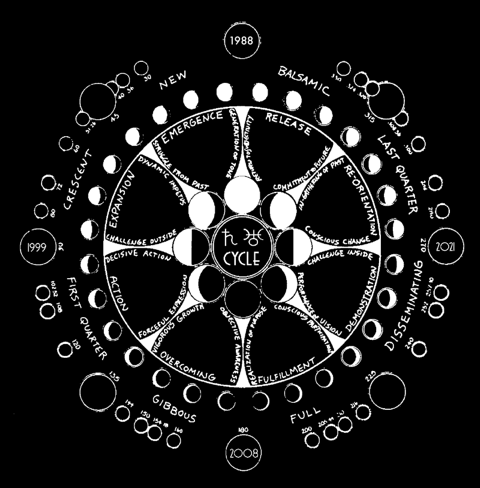 Because the lunation cycle, through its abstract binary structure, portrays the fundamentally harmonious dynamic inherent in any and all cycles of relationship. Consequently, an understanding of the lunation cycle facilitates accurate determination of the timing and nature of the predictable stages of growth and development of any cycle under consideration. New: Emergence - generation of new tone; struggle from the past. Waxing Crescent: Expansion – dynamic impetus; challenge from outside. First Quarter: Action – decisive action, forceful expression. Gibbouus: Overcoming – vigorous growth, objective awareness. Full: Fulfillment – realization of purpose, conscious participation. Disseminating: Demonstration – performance of vision, challenge inside. Last Quarter: Re-orientation – conscious change, in-gathering of past. Balsamic: Release – commitment to future, return to subjectivity. By applying this archetypal series of transformations to the current Saturn/Uranus cycle it is possible to see the whole process at once and thus to determine where in its unfolding context we are currently positioned. Further, if we align our actions to this unfolding pattern, we are empowered by its natural harmony to consciously let go of the way things have been in order to participate fully in the Now. Vividly aware of what action is most appropriate to the current stage of cyclic process, we act In concert with the cycle’s stage-by-stage directives. Consciously letting go of all that no longer matters, we move on, in peace. The current Saturn/Uranus cycle progressed to exact opposition on November 4, 2008 (the VERY DAY of the American federal election that put Barack Obama in the Whitehouse). According to the inner structure of the Saturn/Uranus cycle, a powerful moment of objective awareness is possible during the opposition phase so the synchronicity between the election of Barak Obama and the exact "Full Moon" point of the Saturn/Uranus cycle is not to be overlooked! Owing to the fact of the global impact this man's life and Office have on world politics, I believe we can look to him as a powerful reference point in our attempt to understand objectively, the concrete reality posed by the current Saturn/Uranus cycle. During the course of an extended period of opposition, Saturn and Uranus faced off a total of five times between November 2008 and July of 2010. This period of time is an extended "visionary moment" for all humanity. It is a time during which we have been called upon to objectively come to grips with the polarized dynamic of freedom (Uranus) and control (Saturn). On a personal level, this looks like getting clear about what you and I really stand for with respect to these issues. Conscious choices based in objective self-awareness are what has been called for during this time. 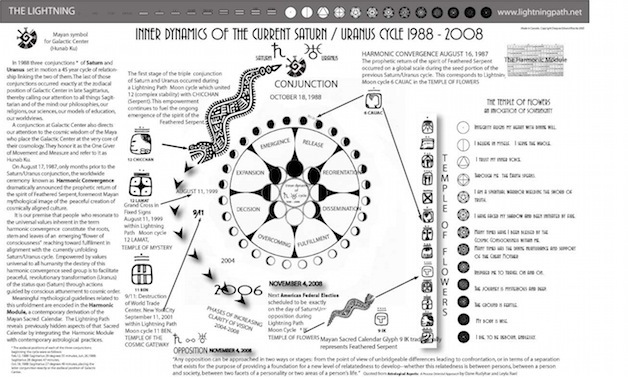 The astrological mandala shown above is a synchronic view of the whole of the current Saturn/Uranus cycle that began in February 1988 and which comes to completion with the next conjunction on June 28, 2032. It is being presented here, specifically to place in a celestial context, the progressive manifestation of what I call the Dream of Harmonic Convergence. This Dream relates directly to, but is not limited by, the massive, globally synchronized sacred sites ceremony known as Harmonic Convergence, August 16, 1987. Harmonic Convergence took place during the "balsamic" or "release" stage (commonly known as the “dark of the Moon“) of the prior Saturn/Uranus cycle. The balsamic stage in any cycle is when the spiritual essences of all prior events related to that cycle consolidate into a seed of potential that acts as the source of a new cycle. (This is why I consider Harmonic Convergence to be a "seed" event.) This seed generates a new creative impulse or "tone" that carries forward the consolidated spiritual essences of the prior cycle. In doing so, it becomes the source of an entirely new cycle of manifestation. What does the Saturn/Uranus cycle tell those of us seeking to manifest the Dream of Harmonic Convergence? What is appropriate action during this stage of the cycle? Coming as it did, very near the conjunction of Saturn and Uranus in 1988, Harmonic Convergence metaphorically constituted the seed Source of a “plant” of collective consciousness that has developed since that time. This development has been very much in synch with the world-wide growth of the Internet. Now, as the "Full Moon flowering" phase of the Saturn/Uranus cycle has arrived, a timely opportunity exists for those of us wishing to manifest the values of peace and harmony inherent in the Dream of Harmonic Convergence. Now is the time for each of us to catch a vision of how that Dream can be fulfilled. But, what does this actually mean? How does this potential for a flowering of the Dream of Harmonic Convergence translate into day-to-day living? To answer this question we need to look first of all to the source of the cycle within which the flowering is taking place. In doing so, I wish to also introduce what are known as the Sabian symbols, one of the most powerful bodies of symbolism available for exploring the meaning of any astrological configuration. There is a distinct Sabian symbol for each of the 360 degrees of the zodiac. The facility of the Sabian symbols to provide meaning to astrological events is evident when we apply them to the trio of conjunctions in 1988 that signaled the start of the current Saturn/Uranus cycle. The exact zodiacal position of each of these conjunctions was as follows: Feb.12: Sagittarius 29 degrees 55 minutes, June 26: Sagittarius 28 degrees 47 minutes, Oct.18: Sagittarius 27 degrees 49 minutes. The latter conjunction occurred within a degree of the widely acknowledged position of Galactic Center, what the Maya refer to as Hunab Ku, One Giver of Movement and Measure. The question Rudhyar poses is a significant one to any of us aspiring to make the Dream of Harmonic Convergence a concrete reality. The indication given here is that it will require devotion to more than the purely personal. To manifest the Dream of Harmonic Convergence, we will have to become planetary citizens, thinking globally (and beyond) and acting locally, spiritually unconstrained by the Status Quo. Many organizers of local Harmonic Convergence events worked consciously with the Mayan hieroglyphic symbolism presented by its central organizer, Jose’ Arguelles. I was among that group and was guided and inspired by much of what Jose’ shared. It is important to note, however, that many months prior to Harmonic Convergence, my own relationship to the Tzolkin and its sacred hieroglyphic realm was steering me into an even more compelling and enduring adventure than what Arguelles has since evoked through his post-Harmonic Convergence Dreamspell formulation. I refer here to what I now call The Lightning Path. The Lightning Path taught me how Uranian transformation can arise harmoniously from what amounts to a highly Saturnian schedule of development. In other words, I learned how freedom (Uranus) and control (Saturn), often considered to be in conflict with each other can, instead, be experienced harmoniously. The Lightning Path showed me that one key to attaining such harmony resides in coming into conscious and sustained attunement to the constantly changing, yet predictable, dynamics of the cycle linking these two planets. A Saturn /Uranus cycle is always unfolding and its guidance is universally available to anyone who pays attention to it. Obviously, endless possible interpretations and forms of attunement drawing upon it are possible. For the purpose of the present discussion, however, I wish to use the symbolism of The Lightning Path as a basis. This will also show the way one can extract personal meaning from the universal storehouse of knowledge that is the Tzolkin. 1) The first of these conjunctions occurred on February 12, 1988 (in the Lightning Path Moon cycle, 12 CHICCHAN). This was just six months after Harmonic Convergence and still within what is known on The Lightning Path as The Temple of Flowers. TWELVE calls our attention not to the purely personal dimension of life but rather, to its transpersonal breadth and depth. All non-essentials have been stripped away by number ELEVEN and what remains with TWELVE is the seed essence of any process. CHICCHAN denotes the wisdom of the body and of the race. It is commonly associated with the evolutionary energy known as kundalini, the primal, integrative force at the core of the process leading to the attainment of autonomic functioning in any nervous system. Within Mayan cosmology it refers to the serpent of sacred knowledge. The Lightning Path is a cyclic journey of the revelation of sacred knowledge and of the formulation of a condition of integrated group consciousness operating in attunement to celestial order. Elements of that order are inherent in the close timing proximity of Harmonic Convergence to the Saturn /Uranus conjunction and, consequently to TWELVE CHICCHAN on The Lightning Path. For those of us dedicated to fulfillment of the seed potential contained within Harmonic Convergence, the current Saturn/Uranus cycle can be used as an astrological aid to this fulfillment. A collective planetarization of consciousness is unfolding through us and we can be assisted in the process through an ever-more-conscious alignment to the dynamic relationship between Saturn and Uranus. TWELVE CHICCHAN counsels that such awareness will only come to the extent that we are willing, like the serpent, to shed the limiting skins of belief we hold about who and what we are. This is why Harmonic Convergence, as the dramatic annunciation of the immanent return to human awareness of the spirit of Feathered Serpent, calls us to look to the transpersonal dimension of the human psyche for the wellsprings of sacred knowledge necessary for the co-creation of a spiritualized, self-renewing culture of peace. The TWELVE CHICCHAN Moon on The Lightning Path integrates that aspiration to the current Saturn/Uranus cycle and thus provides a strategic timetable for its manifestation. 2) According to The Lightning Path, the second of the triple conjunctions that started the current Saturn/Uranus cycle occurred on June 26, 1988 thus placing it not in The Temple of Flowers, as was the first conjunction spoken of above, but rather, in The Temple of the Skywalkers, next Lunar Year on The Lightning Path. The exact Moon cycle is designated as FOUR OC (pronunciation: oak). FOUR is solid power and emphasizes alignment with the quadrature inherent in all cycles and most obvious to us as the seasons of spring, summer, fall and winter. FOUR represents the preliminary foundation of a self that unifies directional lines of force. It calls us to embrace order, definition and discernment as we work to establish ourselves in the world. FOUR represents the fourth chakra, natural home of our objective awareness, our “witnessing consciousness.” This is a consciousness “in the world” but not necessarily “of the world.” OC signifies breakthroughs and new beginnings, relationships and companions of destiny, FOUR OC draws upon the wisdom of the serpent of sacred knowledge by calling us to ceaselessly begin anew in overcoming all manner of emotional discord as we move progressively deeper and deeper into an awareness and appreciation of our common humanity. Attunement is always the key to the most basic type of knowledge. In the ancient past, man attuned his consciousness to the great rhythms of universal Life through the intermediary of a mind that either passively and naively reflected the cyclic play of the seasonal life as it was revealed in his local environment, or was totally conditioned by a rigid psychic-occult tradition. Later on man tried to grasp by intellectual-rational means the 'laws' of the universe in an objective and formalized scientific manner. But beyond such an intellectual and quantitative-statistical approach, and by reawakening some of the lost capacities of his earlier evolution, man may now begin to attain a new, more truly conscious state of resonance to That in the field of existence in which he participates.Man may know beyond mere cogitating and rationalizing; he may see, feel, respond to the great planetary and cosmic Play of forces and powers, and vibrate to the everlasting, though ever-transformed Harmony of existence. That Harmony he had lost - but only to regain it in a truly conscious and participatory sense; not merely in terms of the world of Nature, of materiality and life, but as a direct experience of his divine Source and of the Principle of Wholeness whose presence illumines his total being as well as the universal Whole.  I see the triple conjunction of Saturn and Uranus as a potent source of symbolic guidance for the gradual emergence in the present era of the profoundly liberating serpent of sacred knowledge (12 CHICCHAN) known more broadly as Quetzalcaotl, the Feathered Serpent. That emergence is currently underway through the creative works of a widely dispersed group of heart-centered individuals (4 OC), companions of destiny who are deeply committed to serving the Greater Good as co-creative technicians of the sacred (8 IX). Attunement to the Saturn/Uranus cycle tells us that it is now well into its opposition phase. Those of us committed to leaving the pervasive Dream of Endless War behind us need now to CONSCIOUSLY PARTICIPATE in manifesting the Dream of Peace, the Dream of Harmonic Convergence. May we continue to find increasingly effective means of communing in consciousness with each other, no matter where on the planet we reside at the moment. May a common vision of radiant human fulfillment empower our every act! Click here or image to access download page for this illustration.